Like most business owners, homecare managers are always on the lookout for tools that will improve their business by saving money, improving efficiency or attracting new clients. The technology of care management software is one tool that more and more in-home elder care agency owners are finding is indispensable. However, after you’re convinced that an increased use of technology is what’s best for business, how do you convince your employees and clients of the same? In speaking with elder care agency owners, we have repeatedly heard the concern of caregivers being resistant to change. Seemingly, many professional caregivers are concerned that introducing a new technology to their routine will take extra time during client visits, or that they will simply have a hard time learning to use the new care management software. We’re human, after all, and may be naturally resistant to change. 1. Be Excited: Oftentimes, employees will feed off of the attitude of their supervisors. Let your caregivers know how excited you are about the introduction of new technology for shift scheduling, time tracking and point-of-care management. 2. Explain the Benefits: Let caregivers know that the implementation of ClearCare homecare software is intended to not only make operations in the back office flow more efficiently, but also to allow caregivers to do their jobs better. Explain that clock-ins and clock-outs will be electronically tracked and reduce the risk of errors in payroll. Show that care plan updates will be available immediately and that they won’t need to keep track of paper care logs anymore. And finally, show them how they receive their shifts along with directions to the client’s home every day at 5pm by text message or email, and how they can login online and see their monthly calendar anytime. 3. Provide Training: Make it clear to employees that ClearCare software is as simple to use as many of their favorite consumer websites. Provide training that highlights the intuitive, user-friendly interfaces and make yourself available to offer assistance to caregivers that have any questions during implementation. The client base for homecare agencies includes both the elderly individuals that are being cared for in their homes, as well as family caregivers that provide assistance when your in-home care agency isn’t on duty. Exactly who those family caregivers are can range from a senior spouse to an adult child or grandchild. Likely, the level of comfort with technology among your clients will be as varied as the clients themselves. Thus, the question arises: How do you introduce clients with a varied level of technology to the benefits of ClearCare homecare software? 1. Keep Clients Informed: When you choose to begin using homecare software, like ClearCare, keep clients up-to-date with a letter, flier or e-mail. Have caregivers explain what they are doing when utilizing the ClearCare system in the field. As an agency manager, take the time to sit down with our client’s families to explain the point-of-care visibility of ClearCare, how the software will improve care and demonstrate the value of any increased client billing costs associated with the software implementation; which may be as little as $10/month with ClearCare! 2. 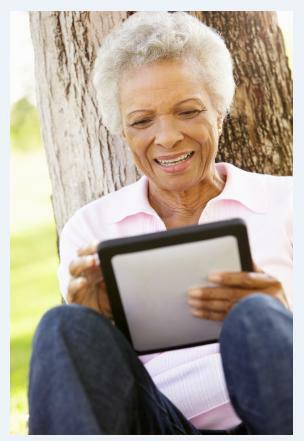 Demonstrate The System: While clients that are familiar with technology may be more accepting of homecare technology, those who are unfamiliar with computers might be apprehensive. Make yourself available to family members who are worried about how homecare software works and offer a demonstration of the technology. We live in a world where technology plays an integral role. Let ClearCare homecare software be the technology that propels your homecare agency to the next level!